A gastronomic landmark for French contemporary cuisine. Breakfast Mon.-Sat., Lunch & Dinner Mon.-Fri. until 10pm, Brunch Sun. 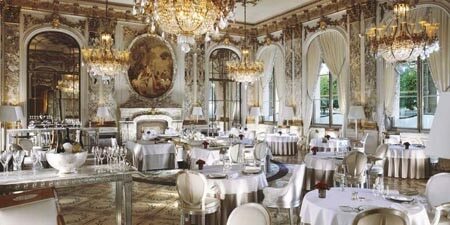 : Le Meurice offers French contemporary cuisine crafted with topnotch ingredients. As for the dining room, it is one of the most beautiful in Paris (not to say the world), facing the Tuileries garden and decked out with marble, bronze, chandeliers, ancient mirrors and frescos. Philippe Starck lightly and shrewdly modernized the place, adding red copper fixtures and black screens embedded with photographs. Needless to say that the fare is on par with such a ritzy place. Previously at Alain Ducasse at The Dorchester in London, Jocelyn Herland delivers exceptional courses. Frédéric Rouen, the genial maître d’, and his impeccable staff are in charge to explain what goes with the foie gras, the lobster or the lamb. As it happens, following steamed vegetables served in a casserole dish for an appetizer, the foie gras is one of the signature items. The chef stuffs it in a hot pâté along with cabbage, mushrooms and crispy vegetables and drenches the whole with poultry juice. Lobster in its bouillon comes next, prepared with Jerusalem artichokes, skipjack and hibiscus. The lamb recipe gives a nod to North Africa. It’s dressed two ways, with artichokes and Espelette pepper, and as a meatball with coriander, lemon and bulgur. Before the dessert, you can indulge in a few exceptional cheeses that are brought over in a cart, such as the 24-month-refined Comté. The tart elaborated with 100 percent cocoa from Peru and accompanied with ice cream flavored with Kopi Luwa, an Indonesian coffee, makes for a fine finale. Complement the meal with first-rate wines such as the 2012 Hermitage Domaine du Colombier and you’re in for an unforgettable experience.